Fava beans (Vicia faba) are edible, broad legumes that come in flat, light-green pods. Also known as broad beans in the U.K., these flowering plants are among the most popular bean varieties in the world. Moreover, they can easily be grown in home gardens and do well in cool temperatures, which are major factors in their popularity. Fava beans are well-loved for their culinary use and their impressive nutritional value. Although dense with carbohydrates, fava beans are low in cholesterol, sodium, and saturated fats. 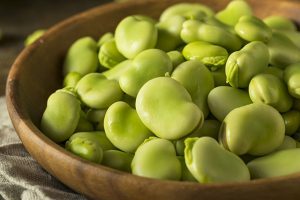 One nutrient that fava beans are high in is vitamin B9 or folate, with a one-cup serving providing 44 percent of the recommended daily value. Thanks to their abundance of vitamin B9, fava beans are highly recommended for pregnant women because they need adequate amounts of vitamin B9 in their diets to prevent neural tube defects in their babies. Fava beans are a good source of potassium, a nutrient that counters the negative effects of sodium on the heart and blood pressure. This in turn minimizes the risk of developing stroke and high blood pressure. Whether cooked or raw, fava beans are packed with both soluble and insoluble fiber. These two kinds of dietary fiber are highly beneficial to the body, but insoluble fiber is especially useful in promoting a healthy digestive system. Like many legumes, fava beans are incredibly versatile as a vegetable. They’ve been used in summer salads, risotto, pastas, rice meals, and poultry dishes. In Morocco, fava beans can even be eaten for breakfast as beyssara, a spiced fava bean stew or dip served with bread. Note: Dried fava beans are best cooked after being soaked in water for a few hours. Not only does this process make the beans softer and easier to prepare, but it also removes phytic acid. This plant-based compound is notorious for impairing mineral absorption and raising the likelihood of developing iron or zinc deficiency. In addition to potassium, fava beans contain magnesium and phosphorus, both of which are nutrients that help maintain a steady blood pressure. Fava beans can aid in weight loss thanks to their good amounts of fiber and protein. Together, they can decrease hunger pangs and make one feel fuller for longer periods of time. A cup of cooked fava beans can deliver 1.6 micrograms of manganese, a nutrient that supports the nervous, endocrine, and immune systems. This means that eating fava beans on a regular basis can prevent the onsets of arthritis and osteoporosis; furthermore, fava beans can decrease the severity of the symptoms associated with premenstrual syndrome (PMS). Individuals who’ve developed oxalate urinary tract stones in the past are advised not to consume fava beans as they contain oxalic acid. However, one may reduce the risk of developing oxalate stones in their urinary tract by frequently taking in water to maintain a normal urine output.